Recently people of Aamjiwnaang added to some of the photos Iâve been taking of their community by drawing and writing on them. 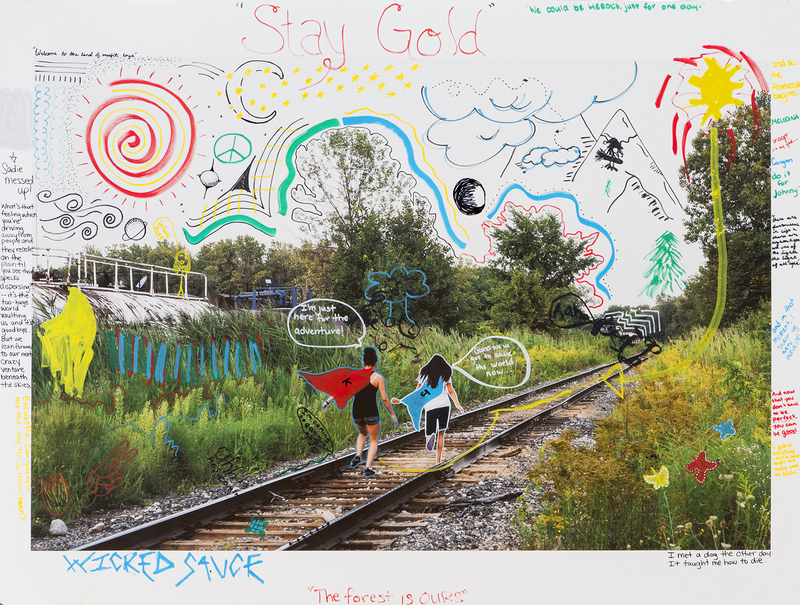 This picture of the railroad that runs through the First Nation's land was transformed by Sadie and Destiny, the two girls running on the railroad, and Destiny's younger sister Kadence. Around the edges, they wrote down some of their favorite quotes. They've also reimagined themselves as superheroes who have to save the world from the oil spill (the yellow blob drawn on the left side) and climate change (symbolized by the two suns). --- In Aamjiwnaang First Nation, nearly 850 Anishinabek people live in the shadow of Canadaâs densest concentration of petrochemical manufacturing. The project âOur Grandfathers Were Chiefsâ explores the youthâs relationships with their heritage and land.